A memorial to Bomber Command had always been controversial, with many people believing that one shouldn't be built. Many of these opinions stemmed from some of the cities, like Dresden, that Bomber Command attacked, during in the last years of World War II. Finally, though, common sense won through and with donations from the public, various businessmen, celebrities and Lords, the £5.6 million needed was soon raised. 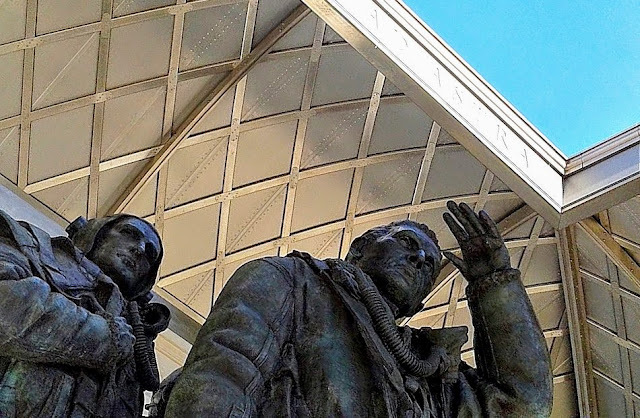 The memorial was built of Portland Stone, to a design by Liam O'Connor, while Philip Jackson sculpted the 9ft statues of the seven aircrew, who are depicted as though they have just returned from a flight. Above the statues, the roof, which incorporates pieces of aluminium from a Handley Page Halifax, shot down in 1944, is open to the elements. This allows for the sky, day or night, to form the backdrop to the statues, when you look up at them.